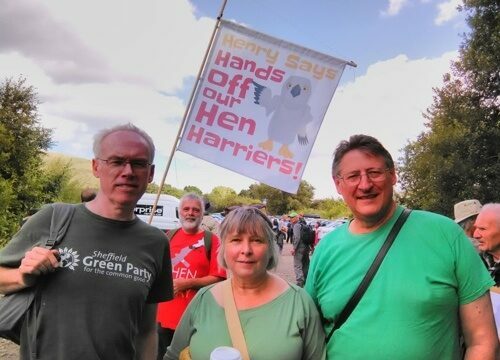 Green Party leader Natalie Bennett gave an inspirational speech at the Peak District Hen Harrier day on August 7th – one of a dozen events around the country just before the grouse shooting season begins. The Hen Harrier is a bird of prey that has virtually disappeared from England. It is a symbol of the mismanagement of our uplands which has led to increased carbon emissions, increased flooding in places like Hebden Bridge and higher water bills for us all. Natalie urged everyone to sign the petition to Ban Driven Grouse Shooting. If we can get to 100,000 signatures there will be a debate in parliament where these problems and the wider destruction of the environment can be discussed. Natalie also spoke about her visit to the grouse moors above Hebden Bridge where she saw dozens of traps used to catch stoats, crows and foxes. The aim for the shooters is to end up with 100 times more than the natural number of grouse and this means killing any bird or animal which might be a threat to grouse. This Facebook page shows how these traps are used in the Peak District. Sign the Ban Driven Grouse Shooting petition here. Well done Sheffield Green Party for highlighting this atrocity. Thankyou to Natalie Bennett and the Sheffield Green Party for coming to Edale on Hen Harrier Day. It is very heartening to see a political party putting in such a big effort to support Green Issues. Respect to you all.